A few years back in time, company registration would have been a tall order for anyone. But since the Government has centralised the registration process at their new center in Manesar (near Gurgaon), you can now register your company far more easily and within a short timespan. Before, the catch was in the name approval process. Some unlucky applicants may even have had to wait for over a year back then just to get past this stage. But the Ministry of Corporate Affairs has now streamlined the company incorporation process in India, and brought it down to one working day. You still need two days for name approval and five days for the rest of the company registration and application process. That’s a total of just 7 days to register your company in India. Most of the applications received are cleared by MCA well within a day, with zero carryover on all days of the week except Mondays. The stage is set for crunching these 7 days required into one, but that’s in the future. Let me explain the current incorporation process. The company registration forms needed are as listed in this table, and the application process in 7 days is described in detail below. The first step to start your registration process is to obtain DSC (Digital Signature Certificate). You can apply for the same with any of the eight certifying authorities. INC-1: Application for Reservation of Name. As this form accords you a choice of 6 names to be proposed as opposed to the 1 name by SPICe-INC-32, you can use this form for reserving your name. You just need to mention the SRN number of the approved INC-1 in your SPICe-INC-32 form. Please note, the name reserved using INC-1 will be valid for only 60 days within which you need to file your SPICe form. 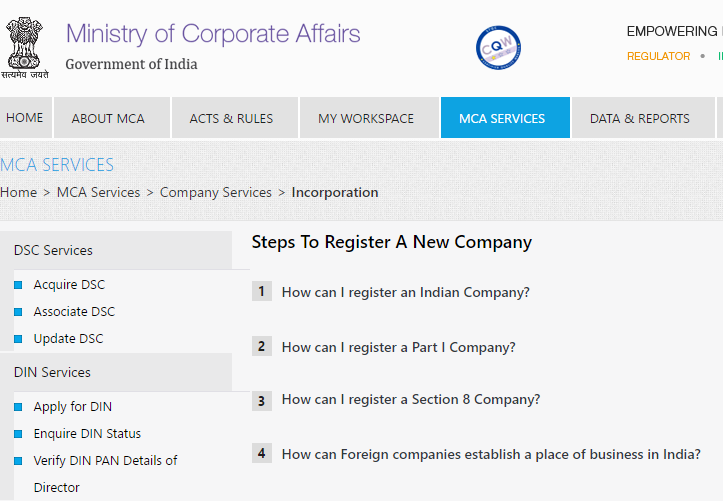 INC-7: Application for Incorporation of Company. Used for registering Producer Companies, unregistered companies and for registering companies with subscribers more than 7 in numbers. DIR-12: Appointment/Resignation and for changes in designation of Directors. As per section 7(1), 168 and 170(2) of the Companies Act, 2013, this form is required to be filed by the company for appointment, resignation and in the case of changes in the designation of directors or key managerial personnel of the company. INC-22: Notice of Situation or change of situation of Registered Office. This form is needed to be filed to specify the registered office address either at the time of incorporation as a linked form to SPICe-INC-32 or separately within 30 days of incorporation. Any change in the situation thereafter to be notified using this form within 15 days of the change. To be used, as a linked form to SPICe, to electronically file your draft Memorandum Of Association. To be used, as a linked form to SPICe, to electronically file your draft Article Of Association. URC-1: Application by a company for registration. As covered under section 366 of the Companies Act, 2013, form URC-1 is to be filed as a linked form to INC-7 by any partnership firm, LLP, cooperative society or any other business entity formed under any other law in force with 7 or more members to register themselves under the Companies Act, 2013 as a Part-I company.